October 9, 2008 - Make sure you like EcoJoes on Facebook to stay updated on green ways to save money and help the environment. Just click the "like" button below. Muchas gracias! 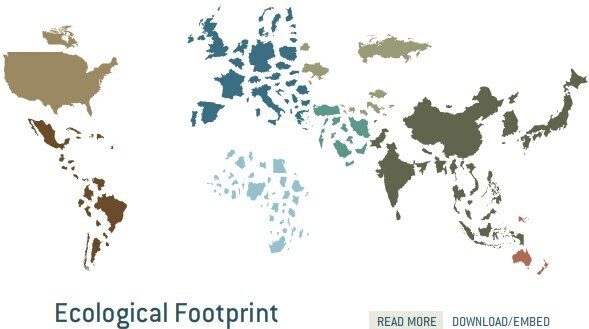 Dang, I found a pretty cool site that lets you choose what to rank different countries by (armed forces spending, CO2 emissions, eco-footprint, nuclear power produced, etc. ), and it’ll generate a map that changes the size of the countries depending on where they rank in the different categories. If that last paragraph didn’t make no sense, you’ll see what I’m trying to explain if you just go to their site. Forilla, even if you aren’t interested in environmental mess, you’ll still think this map-generator is pretty dang cool, if I do say so myself. Posted in eco footprint, world	on Thursday, October 9th, 2008 at 12:25 PM.